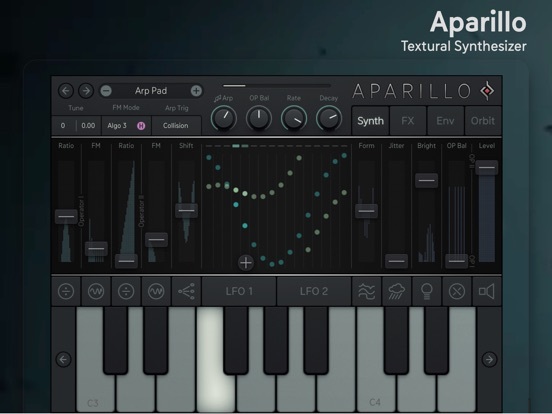 Today Sugar Bytes released Aparillo for iPad! This is a massive 16 voice FM synth which they refer to as, "The Cinematic Machine." In addition to all of the FM synthesis, you can further shape your sound with Formant Shifting, Wave Folding & Shifting, as well as a bunch of built-in effects. As you may expect from all of Sugar Bytes' recent AUv3 updating, Aparillo arrives with AUv3 support. Sugar Bytes has a detailed tutorial series for the desktop version. Doug Woods did a demo of the desktop version when it was released last year. Dj Puzzle from iPadLoops brings us a short demo that quickly gets into a demonstration of how dramatically you can shift your sounds around with the performance controls. The first time I've been blown away by an FM synth. Hated the cliche metallic/bell/whoosh/blip of previous FM synths. This one is truly amazing. The full version (IAP) is 17.99$. Tried the demo , sounds amazing and is a ton of fun to play with ! Tim, are you going to do a video on this one? I think it needs many demos and let’s plays as there are so many ways to mess with it. Probably! There's another video I've planned for this month, and I'm so so so close to finishing AppKaiju that at this point I just want to get it done.